10-year NBA vet DeShawn Stevenson found his rhythm last week and he be jammin! Stevenson (who ranks fourth in the league in 3-point FG percentage) hit three long balls in the first quarter of the Mavericks’ matchup against the Magic on Saturday night and finished with a season-high 24 points. With Dirk Nowitzki missing his seventh consecutive game against Orlando due to a knee injury and Caron Butler sidelined for the remainder of the season, Stevenson has had to shoulder more responsibility in terms of minutes played and productivity. In joining this Dallas group, Stevenson appears to have taken a more professional approach to the game. He’s focused on doing all the things necessary in order to help his team win, whether that be to defend and shut down his opponents or to sink a clutch 3-point shot. Stevenson has gained a reputation for being a hardnosed defender, and the Mavericks can use Stevenson’s veteran experience and toughness to help sustain them during this period of time when they are playing without Nowitzki and Butler. 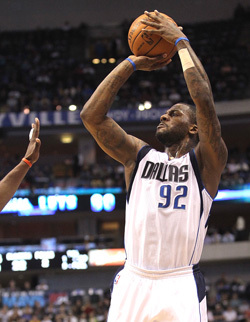 DeShawn Stevenson should continue to start for the duration of the season. Over the last four games he has averaged 19 points, 3 rebounds and 2 assists, and he is available in 80% of fantasy leagues. The Mavericks will hit the road for three away games this week.